Infinity, for those who are of the opinion that seeing is believing, doesn't exist, because they haven't experienced it yet and would probably never. To experience infinity one needs to first believe in the concept of forever, if forever doesn't exist for them, infinity can never co-exist. What could the reason be, that one doesn't believe in infinity, self-experience can never be the only reason, there has to be something beyond that. Something that is beyond the understanding of the human brain, but closer to the heart. A heart that beats for various emotions from longing for happiness, from nothing to everything and technically speaking -infinity t0 +infinity. Can love be forever? Your thoughts? 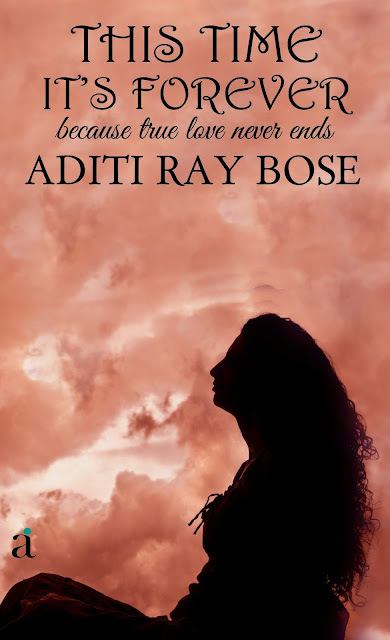 I recently read This Time It's Forever, a book by author Aditi Ray Bose. This is her second book, her debut book was My Dream Man. You can read more about My Dream Man by visiting Book Review : My Dream Man - Aditi Bose. Her second book, This Time It's Forever, is a romance fiction that revolves around the concept of forever, forever love between people. The book is also about how they perceive their own version of 'forever', for one it is longing and for the other is disappearance, yet there is a connection, there is a bond, there is love. This Time It's Forever, has two main characters around whom the entire story is weaved, Arunavo Banerjee and Aisha Ahuja, former being a Bengali and the later being a Punjabi. There are two different cultures discussed in the book and when I say culture, it is not restricted to the traditional values, but it is about the work life, the daily lives and the metropolitan life. By now you would have already understood that the two characters that are in love are Arunavo and Aisha, but the story tells you more about their routine and then love, subsequently which is the 'forever' part in their love story. Both of them had had their own shares of relationship before falling for each other, with resistance. Like any other love story, this story is also about the coming together of two souls and then the separation and the longing to be together, what sets this story apart from the other the meaning of forever it adds to love and glorifies infinite hopes. The narration of the book, This Time It's Forever, is interesting too, it's the story of a single day's journey from Mumbai to Delhi in a flight and how Aisha relives her life and time spent with Arunavo, in constant flashback, only to make us a part of it. The supporting characters of the book are very well defined just like the main characters. The minute detailing about the corporate world and the nuances of individual lives are very well articulated by the author, you will easily relate to the scenarios described in This Time It's Forever. The author, Aditi Ray Bose, will be successful in making you believe that the story is real, the emotions at display by the characters are visible and distinctly vivid. You will love the simplicity of the story, no fuss, no drama, no exaggeration anywhere. Only hopes, hopes of being forever together. I would recommend This Time It's Forever to anyone interested in reading romance genre, with a different ending. I finished this 282 page book in just one sitting and I am sure that you will not put the book down once you start. A well articulated review. One that is in sync with the contents of the book. Forever threatens to find a limit, but examine this limit you always find a segment beyond that limit in the human relationships and that defines the infinite space and the concept of forever. Recall Mahatma Gandhi's Live as if you were to die tomorrow. Learn as if you were to live forever. There is a lot to learn from Aditi's way of writing and gettging her thoughts across to the readeer. And thank you for the illuminating review. pardon the typos in the last line of my comment.